IU Science Fest October 21: Learn How to Do Amazing Stuff! 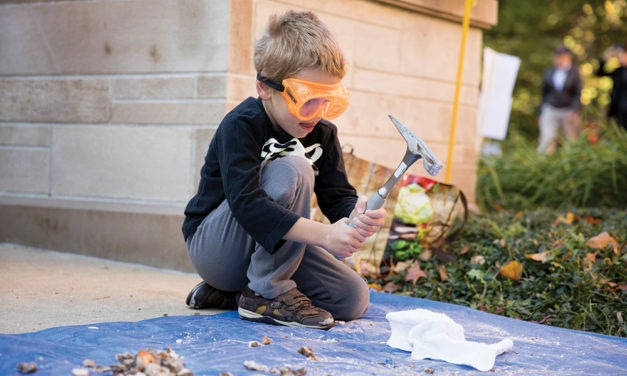 At IU’s Science Fest, visitors can create their own baseball-size comets using water, dry ice, dirt, and syrup. That’s just one of the many activities planned at the free event taking place October 21 from 9 a.m. to 3 p.m. in several buildings across the IU campus. Becky (Anton) Hrisomalos packed something extra when she came to Bloomington to attend Indiana University in 1949—a strong desire to serve others. For many runners, fall is race season, and those looking to hit the road or trail will find several local opportunities. A spiritual vision comes into focus this fall with “A Shared Elegy,” a joint photography exhibit by the Indiana University Eskenazi Museum of Art and the IU Grunwald Gallery of Art.